Grand Sound Quality & Comfort: Arama branded telephone headset is designed for better communication and comfortable long time wearing. 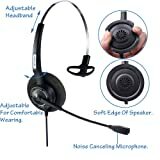 this professional headset can provide nature and clear listening experience with it's sensitive speakers and noise reduction microphone, also have earthquake protection, provide a smoothy communication and a better hearing protect. ultra lightweight and adjustable headband provide comfortable wearing, ideal for daily usage. 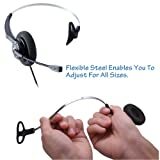 Reliable and Durable headset: Precision design, quality plastics, adjustable headband provides strength and durability, unlike some plastics headband, this headset's headband are made of bendable steel, it's not fragile, you can adjust the curvature to fit different headsize, but do not need to worry about damage it. 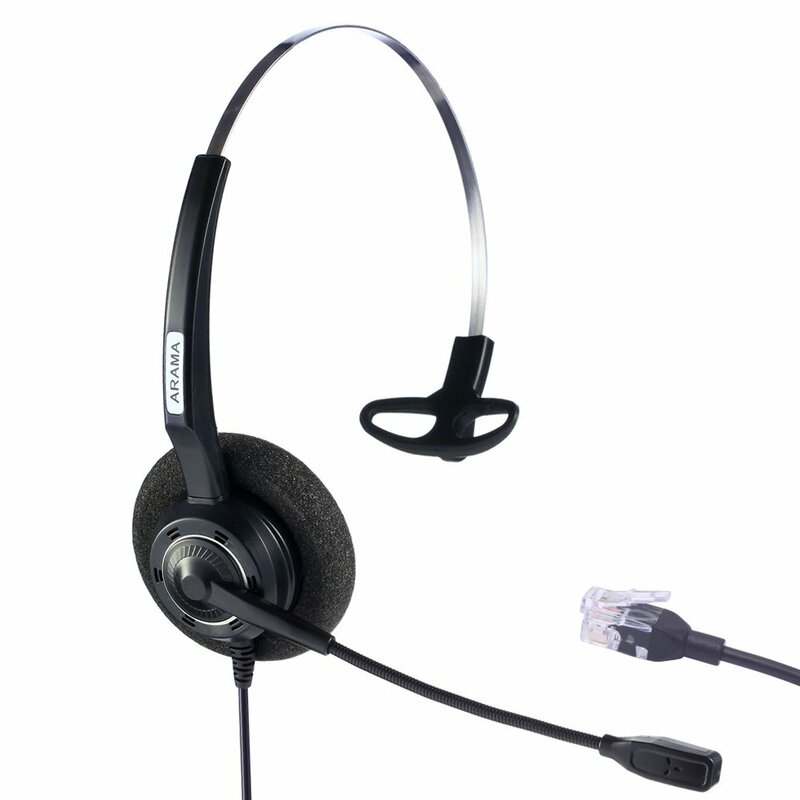 this headset is designed for daily usage, so we use all high quality materials and provide an extra foam pad for the ear piece. 1 year warranty and attentive service at any time. 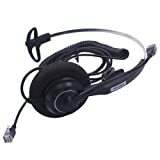 SEE MORE COMPATIBLE PHONE LIST IN DESCRIPTION.Direct connect landline telephone headsets Compatible with Aastra Adtran Alcatel Lucent Allworx AltiGen AVAYA Comdial Digium Gigaset InterTel Mitel MiVoice Plantronics:A100 S10 S11 S12 S50 T10 T20 T50 T100 T110 SP-02 SP-04 SP-05 A100 T50 T100 PLX-400 PLX-500 Polycom:SoundPoint 300 301 335 430 450 500 501 550 600 601 650 670 CX300 CX500 CX600 CX700 VVX300 VVX310 VVX400 VVX410 VVX500 VVX600 VVX1500. Toshiba:DKT-3001 DKT-3010S DKT-3014SDL DKT-3020S DKT-3020SD Strata CIX DP5022F-SD DP5023-SD DP5018-S DP5000-SeriesAVAYA/Lucent: 6402D 6408D+ 6416D+M 6424D+M 8403 8410D 8434DX 4406D+ 4412D+ 4424D+ 4424LD+ 1120 1140 1165 1210 1220 1230 1408 1416 3904 3905 7208 7316 9404 9406 9408 9504 9508 2410 2420 5410 5420 5610 5620 5621 5625 DT1 DT3 DT5 QE4610 4610 4610SW 4612 Etc. Compatible with: AVAYA/Lucent: 6402D 6408D+ 8403 8410D 8434DX 4406D+1120 1140 1165 1210 1220 1230 1408 1416 3904 3905 7208 7316 9404 9406 9408 9504 9508 2410 2420 5410 5420 5610 5620 5621 5625 DT1 DT3 DT5 QE4610 4610 4610SW 4612 4620 4620SW 4621 4621SW 4622 4622SW 4625 4625W 4630 4630SW Northern Telecom :1120E IP1140E IP 1150E IP i2002 1210 1220 M3904 M3905 M7208 T7208 M7308 M7310 M7316 T7316 T7316E M7324 M7900 M8001 M8003 M9516 M9009 NT8B20 NT8B30 NT8B40 NT8B50 Meridian Option M3110 3310 3820 Aastra:2465 2564 480 480e 480i 51i 53i 55i 57i 57iCT 554 564 565 i733 1120e 1140e 7406 8540 9617 6730i 6731i 6739i 6751i 6753i 6755i 6757i 6757i CT 7446i 9112i 9133i 9116 9143i 9480i Dialog 4222 4223 4224 4225 M2216 M3905 M4000 M4020 M7208 M7308 M7310 M7316 M7324 M4000 M4020 M5208 M5209 M5216 M5317 M7900 M8001 M8003 M9009 i2004 i2004 IP Digium:D40 D45 D50 D70 Mitel:5000 5010 5020 5040 5055 5140 5201 5205 5207 5210 5212 5215 5220 5224 5230 5235 5240 5250 5312 5324 5330 5340 5550Plantronics:A100 S10 S11 S12 S50 T10 T20 T50 T100 T110 SP-02 SP-04 SP-05 A100 T50 T100 PLX-400 PLX-500 Gigaset:DE310 DE410 DE700IP DE900IP ShoreTel:IP100 IP212 212K IP230 IP265 IP530 IP560 560G IP565 IP565G IP655 420 480 480G 485 NEC: DTR DTU SERIES DT300 DT310 DT330 DT700 DT730 DT750 DTU-8 DTU-8D DTP-16 DTP-16D DTP-32 DTP-32D DTH-8 DTH-8D DTH-16 DTH-16D DTH-32 DTH-32DDO NOT BUY THE ITEM IF YOU CAN NOT FIND YOUR PHONE MODEL IN LISTS,JUST CONTACT US FOR ADVICE.